Brass dowel pins are perhaps the most versatile of all dowel pins, this is mainly due to the varying quantities of copper and zinc used to produce brass with highly beneficial properties. Brass dowel pins do not mar, and their shape, size, and strength are retained even after being utilized in extreme conditions. Since brass is a non-magnetic and electrically conductive material, these dowel pins are ideally suited for electrical applications. Moreover, brass has a high natural resistance to corrosion. They are slightly oversized for a tight fit. Dowel pins are machined to tight tolerances. The holes that they go into are reamed holes also with a tight tolerance. If you have any different requirements, please feel free to contact us to let us know—we’ll manufacture custom dowel pins of the exact dimensions you need. We use proven manufacturing techniques to create precise dowel pins to suit any application you may have. 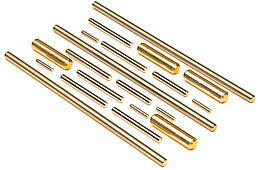 The versatility of brass dowel pins are used in the medical, automotive, manufacturing, aerospace, and other industries. Common applications of these dowel pins are part alignment (in surgical instruments, hydraulic valves, cameras, and more) and in molds and dies in small motors. Browse through the Suburban Product Catalog to find the exact dimensions and specifications that we offer. If you don’t find a dowel pin in a certain dimension, not a problem—contact us for a custom quote.